A vibrant culture is the result of effectively managing attitude, philosophy, and behavior. 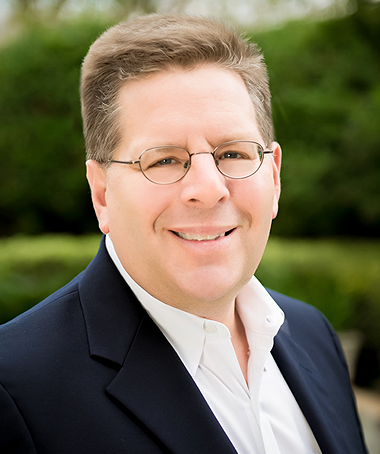 When it comes to leading the way on safety in your organization, you need to maintain a constant emphasis on managing the behavior of your people. Even when you engage and empower your people in the overall process of naming and enforcing safety procedures and operations, human behavior will always enter into the equation. At every step of the way, it is up to you and your key managers to help manage that behavior. In a culture of prevention, behavior trumps rules and regulations. This begins with our own culture perceptions. When we think of compliance in the United States, we often think of following the rules and regulations. A while ago, as Brian was in New Zealand preparing to present one of his workshops on building a vibrant culture, he came across an eye-opening reference from the Māori, the indigenous Polynesian people of that country. The Māori have a term for compliance—tikanga—which means “the way we do things; who we are.” It’s a spiritual approach that requires the buy-in of all participants. It’s about values, and it’s about behavior. Maybe we need to think more like the Māori. Our commitment to tikanga defines who we are organically, not via rule making. In 2014, a truck plowed into the limo of actor Tracy Morgan, killing a passenger and severely injuring Morgan. As it turned out, NTSB findings documented that the truck driver was in compliance with regulations regarding appropriate working hours: he had not exceeded legal driving hours. However, the press reported that the truck driver had pulled an all-nighter on his own time the night before getting into his truck. If true, no regulation could have prevented that driver from getting behind the wheel when he was already exhausted. As documented by investigators and reported widely, poor decisions and behaviors played a role in the cause of this accident. Promoting safety is tantamount to promoting individual accountability. In other words, the key for any employee in upholding a culture of prevention is making the right choices, even when no one is looking! As leaders, we need to consistently enforce this message. 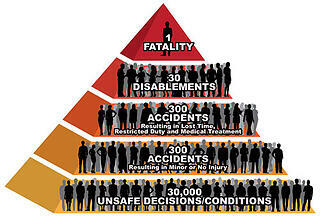 We must demonstrate, teach, and manage acceptable safety behaviors, not just compliance with rules and regulations. An individual accident or injury, no matter how serious, does not simply happen. It is most likely the result of a series of unsafe behaviors that go undetected and without remedy. Perhaps an employee was properly trained but failed to follow safety procedures. Maybe the employee improvised in contravention of safety policy, cutting corners to save time or money and thereby causing something to backfire. Did the accident result from a lack of communication or inadequate training about operating procedures or safety steps? Did faulty or nonexistent auditing of systems contribute to the incident? Was there a lack of institutional memory, meaning that an earlier mistake or incident by one or more employees was not thoroughly addressed and was therefore repeated through another employee’s actions? Leaders must commit to doing everything in their power to ensure that similar mistakes never happen again. In a culture of prevention where behavior is effectively managed, a fatigued equipment operator, driver, pilot, captain, or any employee with responsibility over an operation is empowered to stop for any safety-related reason without fear of retribution. You should be prepared to make the same kind of thorough evaluation, review, and redirection after any kind of accident or safety mishap. Yes, accidents can happen. None of us are immune. In a culture of prevention, though, our primary goal is to prevent accidents before they happen. That means effectively managing the behavior of your employees, even before trouble arises. 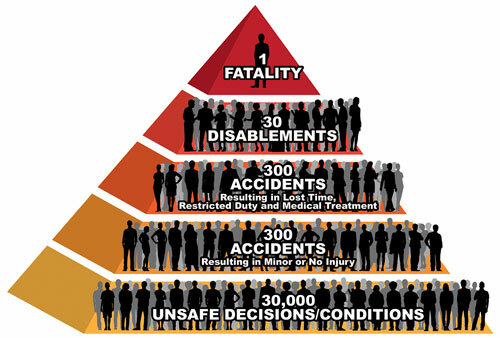 Look at this accident pyramid. Thirty thousand unsafe decisions and conditions result in three thousand minor accidents, three hundred accidents that result in some sort of lost time with medical treatment, thirty disablements, and one fatality. Where do you want to spend your time? Do you want to spend it on the fatality and disablements? We don’t think so. You want to spend your time at the base of the pyramid focusing on the unsafe conditions and decisions that lead up to the disablements and the fatality. What is at the base of the pyramid? Behavior. To create a culture of prevention, we must focus on the decision-making and behavior so that people are empowered to make the right decisions and to err on the side of safety. If you spend your time worried about fatalities and disablements, you are chasing the animals that have escaped the farm, and all you’re going to do is spend your time on more and more animals that escape. If you really want to spend your time eliminating or reducing accidents as much as possible, focus on behavior.